I fell in love so deeply with Sri Lanka when I was there for some training earlier this year, that I made a promise to return again as soon as I could. NOW, my friends, is the time to visit - before the whole of London emigrates! If that wasn’t quite enough to entice you, I’ll be running this retreat with my best pal and wonderful co-teacher Suzie Smith, AND we’ve found a pretty sweet home to offer lots of yoga, meditation, nutritious food, creative practices like drawing, writing, music and voice work, quiet time, great chat and lots of fun! Sitting right on the ocean of the unspoilt south coast of Sri Lanka, this beautifully restored beach house will be our home for the week. We’ll have turtle bays and historic temples a stones throw away, the charming old town of Galle 25 minutes by car, and the vibesy town and surfing hot spots and of Mirissa 40 mins down the coast. 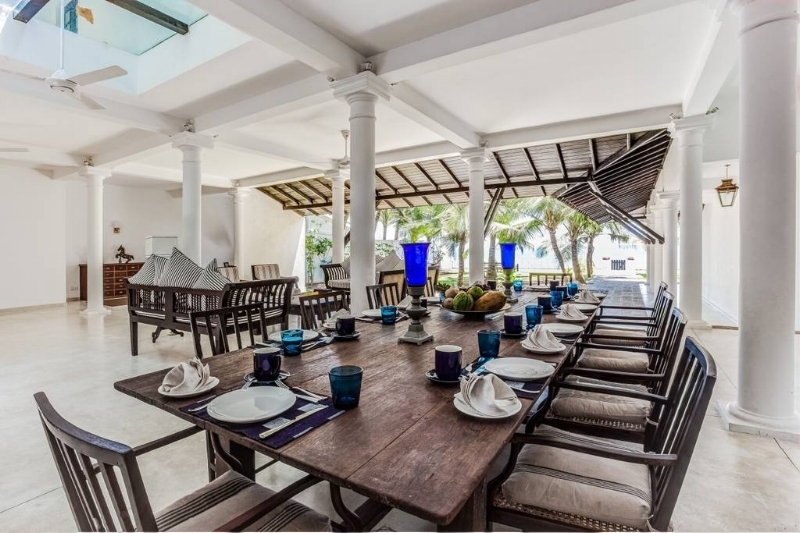 We’ll take a group trip to Galle one afternoon (transfers included) and all other trips can easily be organised once at the villa. The house has seven spacious bedrooms, most of which are en suite, a downstairs living area that opens on to the tropical garden to make the most of the spectacular ocean views, and an expansive upstairs sitting and games area, should you want to peel yourself off the pool-side sunbeds to watch a movie, play cards or cosy up with a great book. We’ll have the whole place to ourselves, and that includes a lovely big pool. air conditioning, wifi, all towels, hairdryers etc! All of your meals will be provided: a hearty and healthy post-yoga brunch, a light lunch to keep you going through those hours of great conversation and lounging around, and a fresh, tasty dinner, all of which will be cooked by the in-house chef. Sri Lankan food is by default seasonal, full of fresh veggies, light, and nutritious, and whilst we’ll be ensuring meals are mostly vegetarian, gluten-free and refined-sugar free, there’ll be the option to try fish (that arrives from that morning’s catch!) and we can also cater for any other dietary requirements, given a bit of notice. Suzie and Kate have 9 years of teaching experience between them and have completed thousands of hours of training. They have been going to classes, doing trainings, and laughing uncontrollably together in London for a couple of years and it made perfect sense to explore their shared love of adventures, yoga and FREEDOM by leading their own retreats together! There will be a dynamic, energising Vinyasa yoga classes in the mornings and relaxing, soothing Yin yoga each evening. Classes are not mandatory, this is your holiday and you are free to do as much or as little as you please! Suzie and Kate will share the teaching each day, with one leading the class and the other either assisting - to give you more hands on help if you want it - or practicing together with the group. We'll also offer up yoga workshops on some afternoons to breakdown certain postures or delve a bit deeper into elements of the practice and some days we'll hold workshops which resonate with our own individual passions, such as writing, sound therapy, voice work and singing; design, painting and tattoo art (no skills in any of these things required to get involved!). Prices for the retreat are per person (see below), with options for two people sharing a room and a queen-size bed (so book with a pal and get some dollar off), having your own single bed in a shared room or having your own big bed and room to yourself! Also if you're coming along solo - which LOADS of people do as it's such a lovely way to make new friends - then we'll do our best to group you in with others who want to share too. * GREAT COMPANY & EXCELLENT CHAT!! YES PLEASE, I'D LIKE TO BOOK NOW! Flights to Bandaranaike International Airport (Colombo) will be your best bet. The villa is about 2 hours and 30 mins from there. Flights are completely up to you to choose and book! At the moment prices are around £420 return from London; we recommend booking sooner rather than later! As many retreaters are choosing to travel around the island either before or after the retreat, we will not be organising or covering airport transfers as it get very complicated! We can, however, recommend options for transport and help you group with others who are on the same flights as you (they’re cheap and easy!)! Just email me on kate@misskatelister.com. I’ll send you bank details to make the initial £300 deposit payment and then the countdown begins! Any questions, drop me a note, or come and chat to me or Suzie in class.